Over the last two years, H. Moser & Cie. has clearly stated its position on the issues that matter to the Swiss watchmaking industry. The brand has created several highly symbolic pieces, intended to highlight the failings or oversights of an industry which sometimes seems elitist and out of touch. But H. Moser & Cie. is now going a step further: the brand has made a long-term commitment to supporting and preserving mechanical watchmaking and its associated professions. 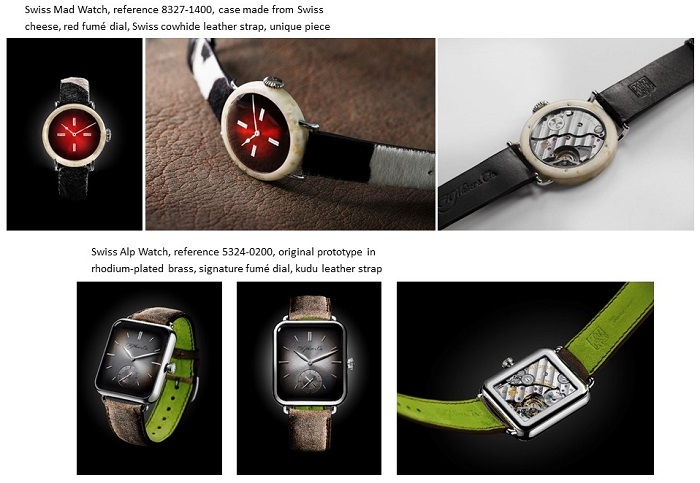 On May 15th, Christie’s auctioned the first two pieces selected as part of this initiative: the Swiss Mad Watch, 100% Swiss, with a case made from cheese, and the prototype of the Swiss Alp Watch, the proud antithesis of the smartwatch. More than simply watches, the two pieces sold by world-leading auction house Christie’s in Geneva on May 15th have a symbolic role. 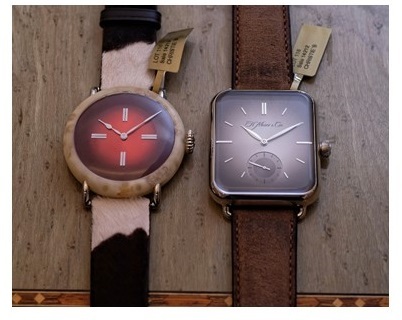 Created by H. Moser & Cie., one in response to the wave of smartwatches, and the other in mockery of a Swiss Made label lacking rigour, these one-off pieces have achieved iconic status, helping bring greater transparency to the debates surrounding these hot topics. Included in the catalogue of rare watches, the Swiss Alp Watch and Swiss Mad Watch were sold as a single lot by Christie’s. This was an opportunity not to be missed by collectors, who ensured the bids came thick and fast. The final amount realised as the hammer fell was 100,000 CHF. The proceeds from this sale will be donated to the Fondation pour la Culture Horlogère Suisse (Foundation for Swiss Watchmaking Culture), helping it to achieve its two objectives: to support apprenticeships in the watchmaking professions and to safeguard expertise in the related watchmaking arts and crafts. "I am delighted to be able to help preserve our Swiss watchmaking tradition through the Foundation, and I would like to thank Christie’s for working alongside H. Moser & Cie. to promote mechanical watchmaking. The sale of the Swiss Alp Watch and the Swiss Mad Watch will enable us to lend our support – with complete transparency – to various projects intended to secure the future of Switzerland's watchmaking expertise, both through training and by helping certain artisan crafts which are in danger of disappearing due to a lack of resources", emphasized Georges-Henri Meylan, President of the Foundation. With the support of Christie’s, a model from the H. Moser & Cie. Swiss Watch series will be sold each year at auction, with the profits donated to the Fondation pour la Culture Horlogère Suisse. The next piece will be unveiled to coincide with SIHH 2018. Put the date in your diary: the surprise will certainly warrant the wait! Christie’s is the world's leading auction house, with auction, digital and private sales totalling £4 billion/$5.4 billion in 2016. Christie’s is synonymous with exceptional works of art, unparalleled service and international prestige. Christie’s organises an average of 350 sales per year in over 80 different categories, including paintings, furniture, jewellery, photography, and fine wines. Prices range from $200 to over $100 million. Christie’s also has a long and successful history of conducting private sales for its clients in all categories, with an emphasis on Post-War & Contemporary, Impressionist & Modern, Old Masters, and Jewellery. Christie’s has a global presence in 46 countries, with 12 salerooms around the world, including London, New York, Paris, Geneva, Milan, Amsterdam, Dubai, Zurich, Hong Kong, Shanghai and Bombay.